At Thrive, we work with you to develop learning environments that are flexible and future-proof, yet perfectly suited to your educational specifications. We’re well-versed in today’s teaching paradigms and help lead your team to solutions that are fresh, dynamic, and well-adapted to the 21st century learner. The new school is framed by the mature trees of its historic neighborhood in Old Town Alexandria. The George Washington Masonic National Memorial stands reverently overlooking the school honoring Thomas Jefferson and Charles Hamilton Houston. 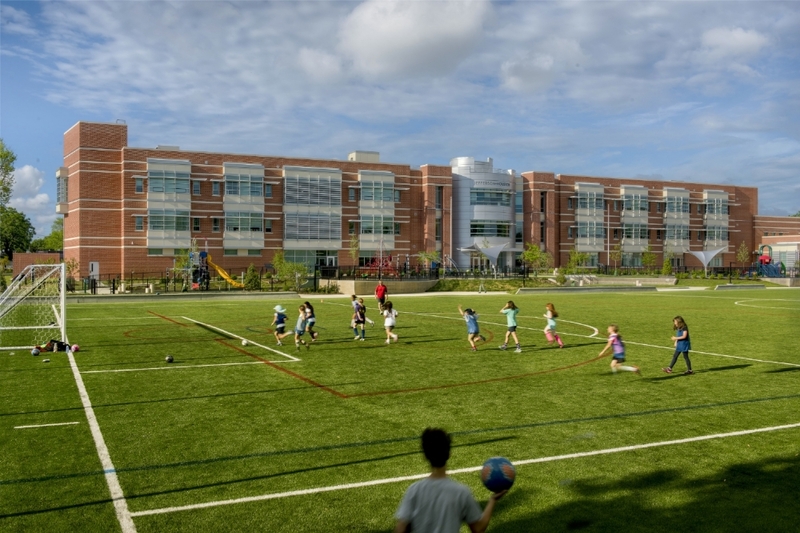 An artificial turf field invites active play and invites joint use by local community groups. Housing the entrance lobby and a rooftop solar observatory, the glass-enclosed cylinder visually anchors the approach from North Peyton Street. The building scale, materials, and articulation harmonize a contemporary building with the historic character of Old Town. 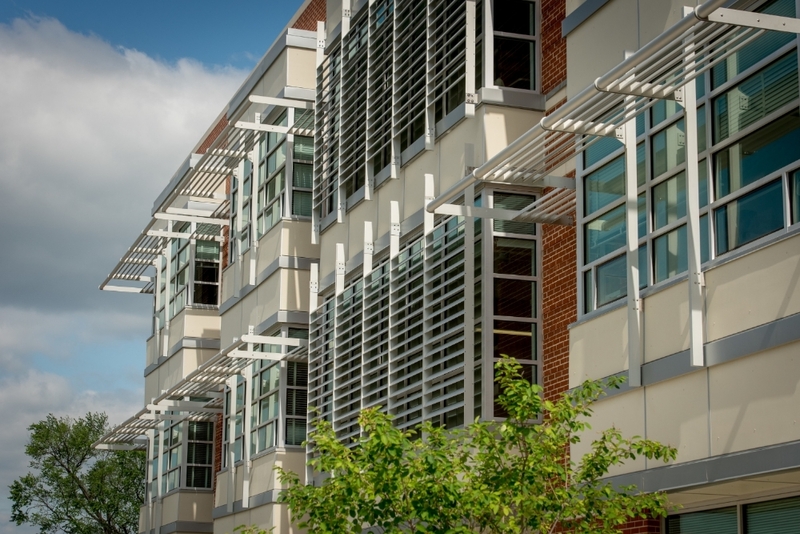 Exterior shading on the south-facing façade was optimized through iterative energy modeling and analysis to reduce energy consumption and minimize unwanted glare in the learning environment. The lobby reflects a minimalist aesthetic that emphasizes functionality of the learning environment. Color and exposed building components add character to the interior spaces. Ground-and-polished concrete provides a durable and elegant finish that can be easily maintained with non-toxic cleaning products. Environmentally-friendly and naturally anti-bacterial linoleum is deployed on both floors and walls to bring color to the commons area in each classroom cluster. Fresh and healthy meals are delivered to several remote serveries throughout the school, allowing students to dine in their own commons area. High-bay LED lights are rarely used in the shared use gymnasium which is naturally daylit by clerestories and well-shaded south-facing glazing. Rooftop monitors provide abundant daylight to the Pre-K common areas. The short western end of the building, seen here from the Masonic National Memorial, has few openings, protecting the interior from excessive solar gains and low-angled glare. The Jefferson-Houston PK-8 School, built in the shadow of the George Washington Masonic National Memorial, is one of just four “failing” schools in the Commonwealth of Virginia. With the state prepared to take over operation of the school, the APS administration committed to building this ambitious new facility in which students follow an International Baccalaureate curriculum. The school and the school design focus on the whole child, and simultaneously offer universal design features that support the school’s large population of multiple-disability children. The design team inspired and designed a first-of-its-kind food service model that prepares school food centrally and delivers fresh food to each classroom pod, allowing students to dine in their own multi-purpose extended learning areas. The school and school grounds also serve this urban community’s extensive need for indoor and outdoor shared-use facilities. Classrooms feature locally harvested/salvaged slatted wood wall & stone panels quarried in VA. These tell geologic & natural history of region & create tangible connections between curriculum & place. White walls and paneled ceilings were softened by the introduction of daylighting, natural materials, and color. Rapidly reconfigurable furnishings allow students and instructors to move seamlessly from large group discussions to small group lab activities. Direct-indirect lighting brightens each science lab, while wireless connectivity and retractable overhead power maximize flexibility. White boards and interactive screens are mounted on rolling wall panels that facilitate a greater variety of furniture configuration. Each lab station features a die-cutter, a 3D printer with direct exhaust, and an arm-mounted video monitor. Ergonomic seating invites continual micro-movements that stimulate brain activity and can increase student focus. This renovation of four middle school science classrooms transformed an out-of-date and dark part of the building into a brighter and healthier educational environment that inspires students and staff while providing the spaces and tools to support the school’s evolving engineering curriculum and Next Generation Science Standards. The design orients permanent fixtures along the classroom perimeters and utilizes rapidly-reconfigurable furnishings for teacher stations and collaborative work areas. 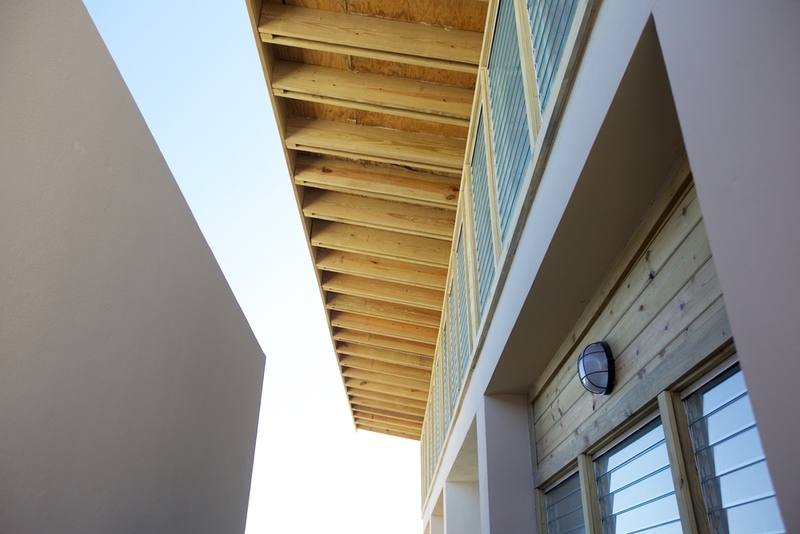 Deep roof overhangs provide abundant shade in the unforgiving tropical climate. This new school for an American-based non-profit working in Hinche, Haiti will provide classrooms for children in grades 1 through 9. The site is adjacent to an existing orphanage compound and will share resources with those buildings which are operated by the same non-profit. The school is divided into multiple buildings and thereby keeps children in clusters of similarly-aged peers while also facilitating the construction phasing process. The proposed buildings wrap the edge of gentle plateau and frame two enormous Mango trees, around which local children frequently gather. Resiliency planning provides for passive survivability of the complex and ensures that the new buildings can endure seismic events, tropical deluges, and hurricane-force windspeeds. Sunrise casts a soft glow on the rooftop terrace. The cylindrical steel planters, showing a rich patina of iron oxide, were cut from the sections of a steel tower found at a local salvage yard. The canopies of mature trees around the building provide a sense of enclosure for the fifth-floor terrace. The roof demonstrates three types of green roof plantings--sedum, meadowscape, and Virginia native. The building's vertical-axis wind turbine generates renewable energy on the roof above. Cable rails and recycled steel bar grating complement the rich diversity of the rooftop landscape. The unfinished Black Locust bench and Pennsylvania Bluestone pavers create a quiet get-away high above the bustle of the university campus. 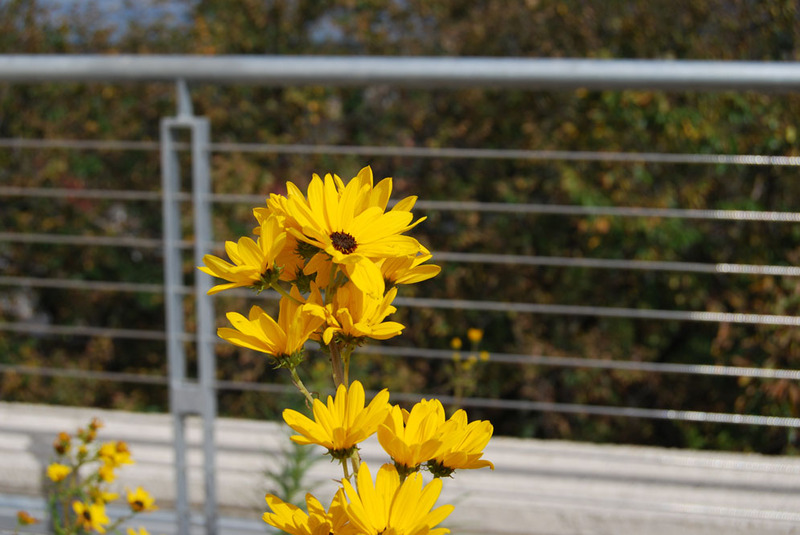 Ironically, some cultivars of the Swamp Sunflower can thrive in a sun-baked and windswept environment as is found on a green roof. The Pollak Building Green Roof was the first green roof on the Monroe Park Campus and helped VCU satisfy the overwhelming student demand for more visible sustainability initiatives. The terrace maximizes the code-allowable occupiable area to provide a natural respite from the severe architecture of the Brutalist art school building. The plantings are organized to demonstrate three different types of green roof—sedum, meadow, and native. For the native section, the team worked with a green roof horticulturalist to identify a wide array of Virginia natives that were suitable for the harsh sun-baked and wind-driven environment. The trade school is co-located with a church, clinic, and guest house--all sharing resources, including renewable energy generated on site. The facility is situated on a ridgetop above Port-au-Prince and accessed through narrow winding lanes. The steep topography offers extensive views, but also necessitates significant cutting and filling of the earth. Large openings and a cantilevered roof form capture natural wind currents rising from the cooler valley below. The clerestory utilizes operable jalousie windows which allow building users to close the building during severe storm events. Locally-cast masonry units provide dappled sunlight to the institute's interior spaces. Straight-forward construction detailing simplifies construction for the American volunteers and semi-skilled Haitian laborers. American and Haitian laborers working side-by side to prepare the reinforcing for a concrete wall pour. Perimeter walls offer a stark reminder that life in Haiti can be challenging. This trade school serves a growing need in the mountaintop community of Thomassin, Haiti. The school was chartered after the earthquake to teach construction trades and basic business skills to the local workforce. 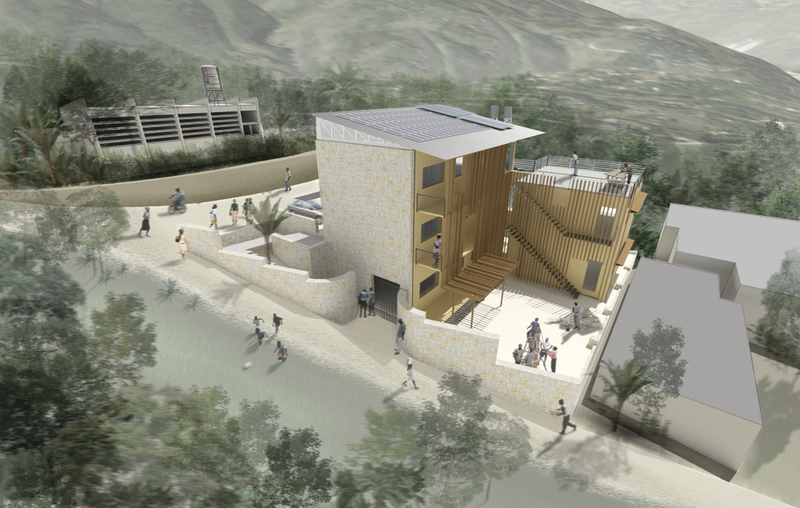 The design uses locally available materials and local craftsman (such as decorative welders) to create a signature building in the community which simultaneously reflects a contemporary aesthetic and Haitian building traditions. The new commons area offers a limited number of fixed computer stations, while providing a great variety of alternative spaces for study. Flexible furnishings support individual study and small group collaboration. Bold color animates the refurbished classrooms which are furnished with rapidly reconfigurable furniture groupings. In the computer lab, equipment can be stowed in the worksurface to maximize adaptability of the space. Overhead power reels in the new student-run Maker Space support reconfiguration of the space and help maintain a safe and tidy work environment. This term-contract summer project included the renovation of one floor in an existing academic building. All classrooms were upgraded with current technologies and new finishes. An aging computer lab was converted into a new student commons, and two classrooms were combined into a single multi-use maker space.